Meet your neighbor Brad Gooding. He is the son of Mike and Jill Gooding and was raised in Bowen, with his brother Mick. Growing up, Gooding recalls, his family was constantly busy as both of his parents worked 8 to 5 jobs as well as extra jobs to provide for him and his brother. Even so, the Gooding family still managed to spend time together and do different things as a family. Gooding's home seemed to be a gathering place for friends to spend time together. Gooding remembers, "One thing my parents stressed to me was be responsible for your own actions and don't look to make excuses." 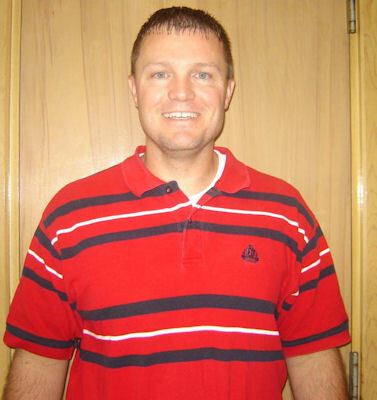 He graduated from Southeastern High School in 1992 and from John Wood Community College, AA in 1994, Quincy University, BA in 1996, and William Woods University, MA in 2005. Gooding and his wife Becky have two sons; Kennedy (10) and Lincoln (7). This is his first year as Illini West High School's principal. He has his hands quite full and is constantly busy. He has previously been Southeastern High School's Social Science instructor, athletic director, basketball coach from 1997-2003, Palmyra School's social science instructor, Physical Education instructor, athletic director, and basketball coach and Unity Middle School's principal. Gooding's hobbies include officiating baseball and basketball games, fishing with his sons, and watching, listening, or reading anything related to history. He feels blessed with many memorable occasions including his wedding and the birth of my two sons. Also, the first time he was sent to the principal's office in the sixth grade, being at the first night baseball game at Wrigley Field in 1988, and playing in the state basketball tournament at the University of Illinois in 1992. Gooding lives life with a positive attitude and says, "Make every day count."